Here’s your answer to an infinitely flavourful yet quick and easy, 30 minute meal! 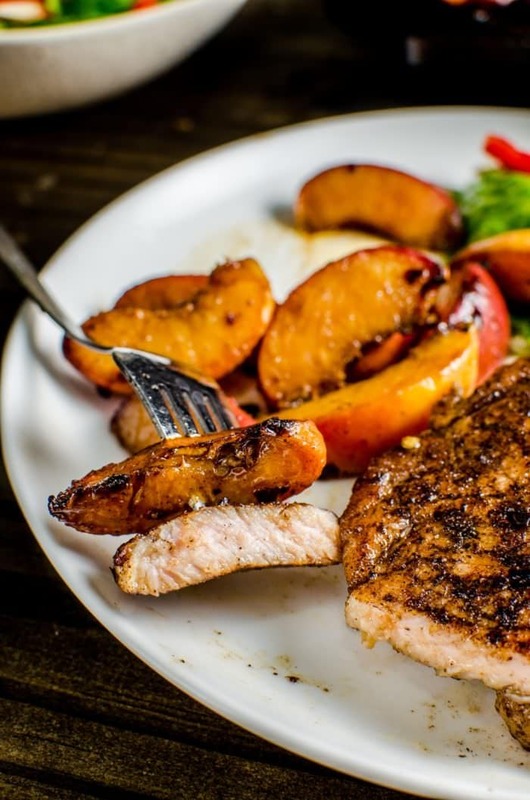 These Pan Fried Five Spice Pork and Peaches are made with Smithfield All Natural Fresh Pork Chops and flavoured with the sweet and spicy notes of Asian five-spice powder. I’m not alone in feeling this way, but those days when I look up at the clock (technically, I just look at the time on my cell phone or on the computer, but it feels more… timeless to say clock, don’t you think?) and realize oh crap, I have to make dinner now – always seem to sneak up on me. I mean I just had lunch and now I’m hungry all over again and I have to make dinner?? That can’t be fair, right? So while resisting the urge to call Mr K and ask him to bring take out, I just pull out my list of fast prep, easy and delicious 30 minute meal ideas that I have up my sleeve for those days. No matter how much I cook, and how much I love to cook, I’m always pleasantly surprised when something this delicious, this exquisite, comes together in less than 30 minutes and just like that, I’ve got dinner and it’s a home run! And these Smithfield All Natural Boneless Pork Chops make that job even easier! While I’ve got nothing against take out or freezer meals (they serve a vital purpose and there’s a reason why they exist), I know I can do so much better with fresh wholesome ingredients and with this five spice pork recipe, I can get it all done in less time than it takes for one episode of Big Bang Theory. 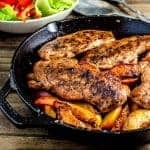 And I also want to switch things up a little every now and then, add some tasty variety to our weekday dinners, and that’s where these Smithfield All Natural Boneless Pork Chops come in handy! 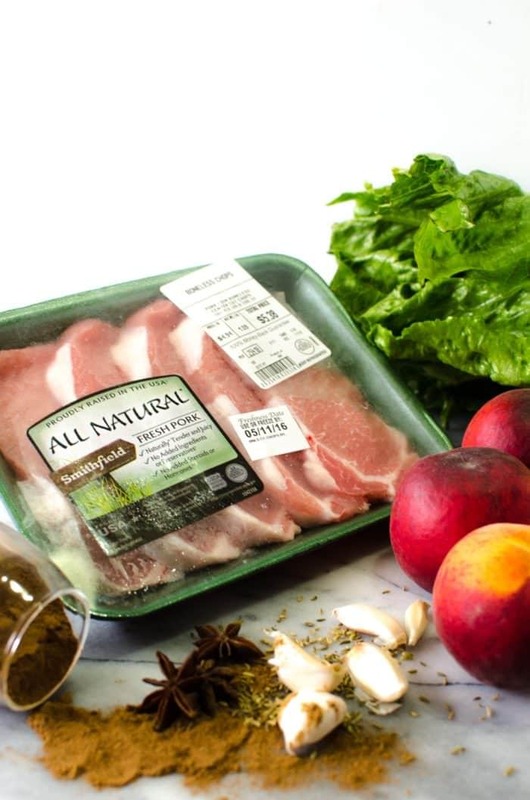 You can now Earn .75 when you purchase (1) Smithfield All Natural Fresh Pork (while supplies last). Just click here to get your own Coupon. Smithfield All Natural Fresh Pork has a variety of pork cuts that’ll suit your needs. And we buy Smithfield® regularly because these products are naturally tender and juicy without added steroids, hormones or artificial ingredients. What I really love about these Smithfield® products is that these pork chops are perfect for quick 30 minute weekday meals, and can be cooked in a number of ways – grilled, roasted, sauteed, to name a few. 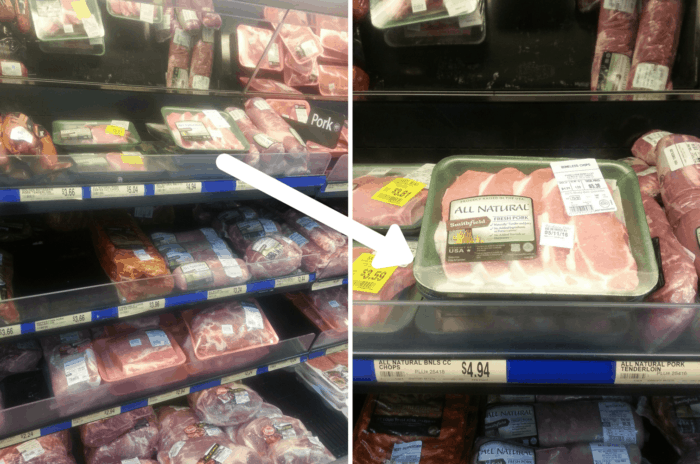 You can find Smithfield All Natural Fresh Pork in your local Walmart store, in the fresh meat/pork section. My hubs is a big fan of pork and his favourite way to eat pork is actually this Spicy Sri Lankan Black Pork Curry – a spicy curry with fantastic flavours and made with Sri Lankan roasted curry powder and tamarind. I make that curry using bone-in or boneless pork chops. But a good curry does take a little bit of time. My solution to that is this pan fried, Asian five spice pork! These spices go really well with a greasy meat like pork. Star anise, fennel seeds and cinnamon yield sweet notes, while the cloves and Szechwan pepper introduce a warm, spicy heat that works like magic in a pan fried pork dish. If you’re making the spice blend yourself, you can mix equal amounts of all five spices together or use more of one or another to enhance a particular flavour profile that you like. 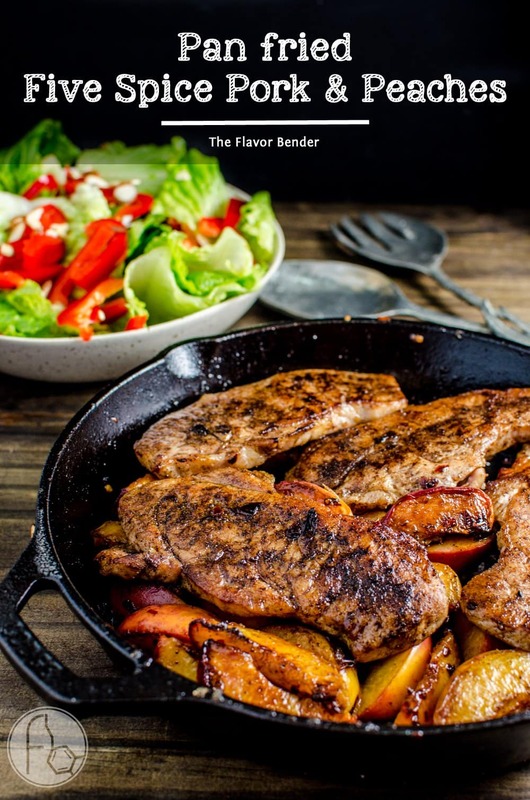 While the Five Spice Pork is really delicious on it’s own…those peaches… my god those peaches! I’m actually salivating right now, thinking about ’em. The sultry spices and the heat of this five spice powder work SO well with the sweet, fresh flavours of ripe peaches. 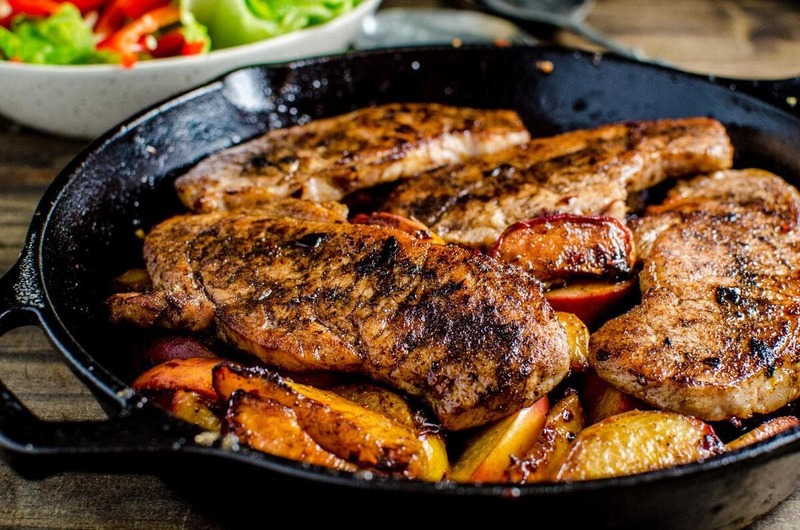 And by pan frying them in the same pan after cooking the pork, not only are you enhancing the naturally sweet flavour of peaches, you’re also adding the pork flavour and a touch of five spice powder to them too. You can use boneless or bone-in pork chops for this recipe. Bone-in pork chops will take a little longer than boneless, but either way, I generally always use a meat thermometer to make sure the meat is cooked perfectly. With the varying thickness of different cuts of pork, the only fool-proof way to make sure your pork is cooked properly is with a meat thermometer, so that’s certainly a worthwhile investment for the future, if you don’t already own one. That being said, these Smithfield All Natural Fresh Pork cook very quickly and it’s perfect for these Pan Fried Five Spice Pork chops. These chops were about 1 cm thick, and they only took 2-3 minutes per side on medium-high heat to reach an internal temp. of 165°F. Heat a cast iron pan (or nonstick pan) to medium high heat and drizzle it with the oil. Next, drizzle some oil on both sides of each pork chop and evenly sprinkle with salt and pepper and the five spice powder. Rub the spices into the pork chops well and set aside. Place the peaches in a bowl and add the garlic, salt, cayenne pepper, sugar and pepper and toss to combine. When the pan is heated, place the boneless pork chops in it (they should sizzle! If not, the pan is not hot enough and you should increase the heat). Cook the pork chops, 2 - 3 minutes per side, until the surface is seared, caramelized and the internal temperature reads 165°F on a meat thermometer. Remove the pork chops from the pan and cover them and let them rest. Place the peaches in the same pan (on medium high heat) and pan fry the peaches for about 6 minutes, flipping them over once after the 3 minute mark. 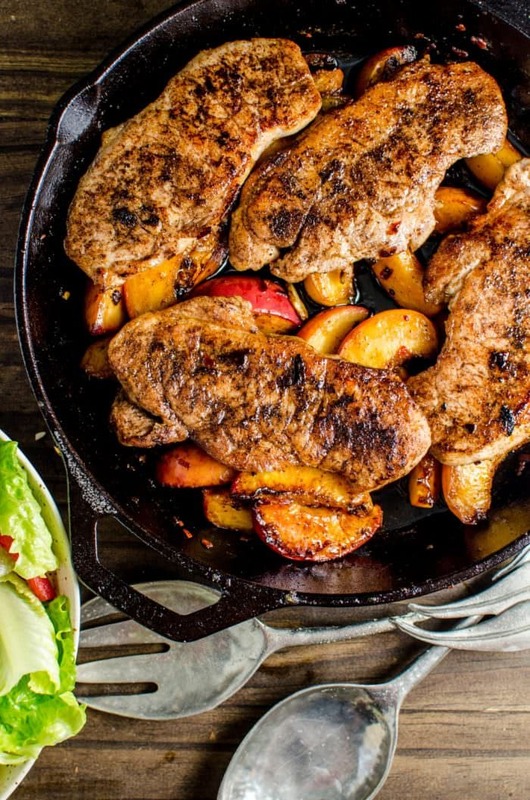 Once the peaches have caramelized and slightly softened, transfer them to a plate, place the cooked pork chops on top. Serve with a simple side salad of Romaine lettuce, bell pepper and slivered almonds. Squeeze some lemon juice or a salad dressing of your choice on top just before serving. Check out these amazing Smithfield Curried Mango Pork Chops for another great dinner idea! 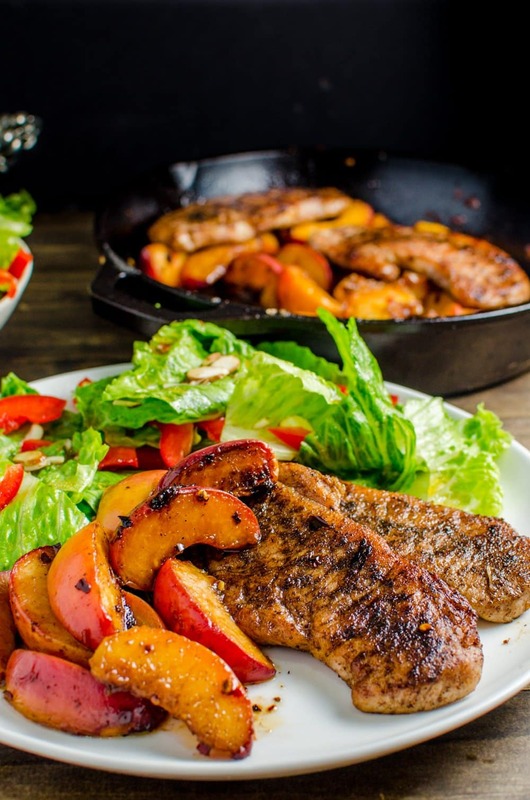 If you liked this pan fried five spice pork and peaches recipe, don’t forget to subscribe for new (and free) recipes by entering your email address on the side bar (and get all these recipes delivered straight to your inbox), so you don’t miss out on a thing. You can find me on FACEBOOK, TWITTER, INSTAGRAM, PINTEREST, YOU TUBE and GOOGLE-PLUS too. I made this for dinner tonight and it was delish! My husband likes garlic, I do not, but even still it tasted great. Definitely a go to recipe! Dini, your pan fried pork chop preparation is to die for! Honestly, half the attraction is the way you present it. In fact the person who is about to eat it is supremely ‘primed’ by the look and the aroma I am sure. So the success is there even before the person has tasted it. You make maximum use of natural ingredients to season it and then to present it. I can see that those are the rules of success. You are doing us all a great service by letting us in on your ‘secrets’. Thank You! Hi, these were great, thank you for the recipe! I am going to make these chops for sure! I am from Colorado and Palisade Peaches from Palisade, Colorado (famous here in Colorado) are going to show up soon at the grocery stores and farmers markets. Thank you for the recipe! Gosh-darn. I can practically taste the unctuous meat met with the sweet, piquant peaches! This sounds just wonderful. 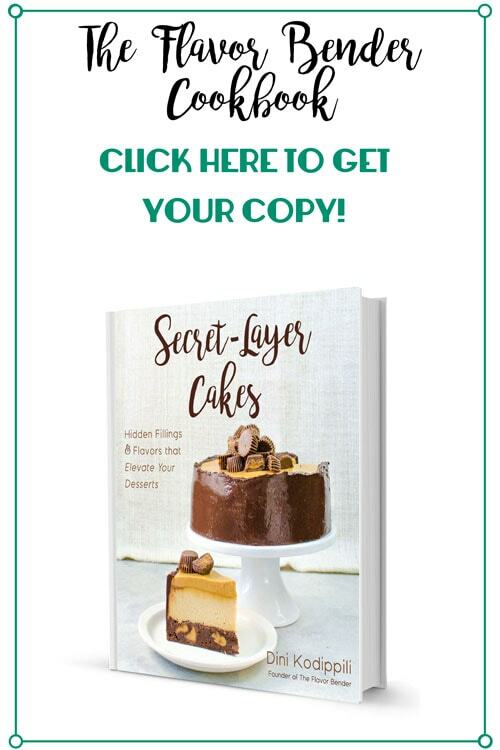 Thank you Dini – nice recipe. This chicken looks AWESOME!!! I love the addition of 5 spice! Oh wow. This looks so tasty! I have never tried the five-spice before but this sounds delicious! I love anything quick and my picky kids will eat pork chops. I get the thin sliced ones for faster cooking because they are usually hovering while I cook. So pretty and the spices are so tasty!